Currently I live in the Seattle/Bellevue area, which is a part of the country that boasts one of the highest levels of education, degrees and high tech specialties. I am 51 with a solid track record of leadership, management and training success in the hospitality, retail and real estate industries. I do not have a college degree; nor do I have a tech background. From career and personal assessments it is clear that I have strong aptitudes in communication, people development, and collaboration. I am emotionally intelligent. Most recently, I have been working with my wife in residential real estate sales in the higher-end market. Regrettably, over the past three years there have been significant challenges that are requiring me to return to the work place. I have been applying to jobs and I have had a few interviews. Recently I landed a job at a local company as a District Manager but they encountered financial difficulties and my position and several others were eliminated. I am very open to opportunities that offer risk but value experience so a recognized company name is not a prerequisite for me. My question is how to proceed and what is the best opportunity for success, job boards or through a recruiter? I would imagine that my situation is very common in today marketplace. Hello. To answer your most important question about whether to job search using job boards or a recruiter, my answer is, “Both,” but I would also recommend doing more. In February of 2010, CareerXroads published their 9th Annual Sources of Hire Study that documents where employers find the external candidates they hire. The good news is that these staffing leaders predict that total 2010 hiring will be up, which is a welcome relief from hiring decreases in 2008 and 2009. The CareerXroads study reveals that 62.2% of external hiring was done through employee referrals (26.7%), the career sections of companies’ own websites (22.3%), and job boards (13.2%) such as CareerBuilder and Monster. Because “employee referrals’ was the #1 way that employers found new employees, we can conclude that the more you can let people know that you are available and what you can do, the higher the likelihood that someone will be able to introduce you to your next job. Tighten up your career focus. I know this is somewhat difficult to do when your experience spans functional areas and different industries, but you have to help people understand your skills and job target or they will have a difficult time doing anything to assist you. As a test, describe what you want to do to someone you don’t know well, like a neighbor or an acquaintance. Ask them for honest feedback about whether they understand your career goals and if they don’t, try to simplify your pitch. Identify professional organizations where you can get involved and become known. Professional organizations are a terrific way to get connected with people who are employed and can provide leads to both current job openings and decision-makers who might be in a position to create job openings where none previously existed. 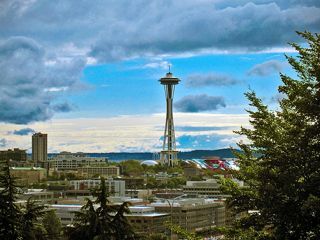 ILoveSeattle.org is a great place to find out what professional associations are doing in the Seattle / Bellevue area. I have also heard good things about Rotary Club of Seattle, although they require a high commitment of time and energy to participate. Consider attending an annual conference or two. You can accomplish more networking at a conference in one week than you can in an entire year otherwise. Your communication skills and emotional intelligence will be huge assets for this part of your job search. Create a profile on LinkedIn. It is increasingly being used for sourcing and a recruiter might find you if you make your profile complete by filling in your career history and getting at least 3 references. Tailor your resume and cover letter every time you apply for a job. This is time-consuming but effective. With a varied background such as yours, you will want to highlight the relevant experiences and skills and downplay the least relevant ones. Think of your resume as a marketing document rather than a complete career history. Don’t send more than one resume to any one company. Rather than cold calling recruiters, ask everyone you know if they have achieved a successful job search result while working with a recruiter. If anyone says that they have, ask if you can get recommended to them. Recruiters give higher priority to candidates who come to them via a trusted third party introduction. If you do decide to cold call recruiters, read this article, “Executive Recruiters: How They Can Help You To Find Your Next Job” and use VocationVillage.com’s Directory of Seattle Recruiters and Employment Agencies. While you are job hunting, consider doing some contract training or some other type of consulting congruent with your background. When recessions end, consultants and contract workers tend to be hired before salaried employees, so if you really need quick income, this might be a path to get some money flowing in faster. It is also a wonderful way to get connected with employers. I wish you luck in finding a terrific new position!